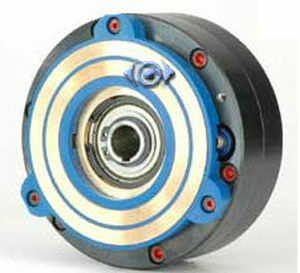 Magnetic particle brakes and clutches are of simple design. Due to their size they produce a high torque compared to for instance hysteresis brakes. They are having two rotors (inner and outer) and an air gap between these two rotors where the magnetic particles are dispersed in. An electric current passing through the coil creates a magnetic field, which aligns the magnetic powder into the gap. The higher the current, the more rigid the connection between the inner and outer rotor becomes. The principle is the same for brake, clutch and torque limitor.